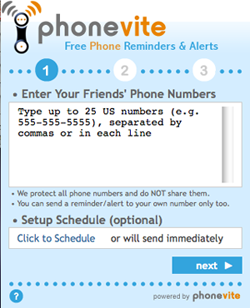 Phonevite Makes Mass Phone Calls Even Easier. Uh-oh? Phonevite, a mass-messaging startup that launched earlier this year, is launching a new Express version of their product that makes the service even easier to use. Photevite’s main service involves mass-broadcasting phone calls to groups, which has an endless number of possible uses. Clubs use the service to organize get-togethers and parties, while some school systems use it to notify parents when their children have ditched class. Users can send their messages to up to 25 numbers at once for free, or they can opt for a paid plan that allows them to call up to 2,000 numbers at once. The new PhoneVite Express service makes the process even easier, allowing users to place a call without creating an account. To use it, you simply enter your own phone number, along with a list of the numbers you’d like to call. A moment later your phone rings and the system prompts you for the message you’d like to send to your friends. Obviously Phonevite seems ripe for abuse – crank callers would like nothing better than to annoy 25 people simultaneously. The site tries to avoid this by requiring calls to be initially placed from a valid phone number (you can’t do it using your computer’s microphone). It also makes it easy for call recipients to opt-out of any future calls, and if too many people label your call as bogus, your account is terminated. These measures are enough to mitigate most concerns, but today’s release of Phonevite Express makes it easier to place mass calls, which isn’t necessarily a good thing. Sure, you can tell Phonevite to never call you again, but it’s just one more thing to deal with. Sometimes it’s a good idea to have a few hurdles in place for a service like this. On the other hand, used properly, Phonevite Express could be a boon to friends looking to arrange impromptu get-togethers (enough so that I plan to use it myself). Let’s just hope it doesn’t fall into the wrong hands.